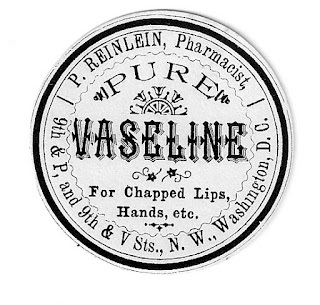 Anyone that has struggled with a tamper-proof medicine bottle or prescription pill container often recalls the days before such child-proof lids made the job of opening a vile a simple task. 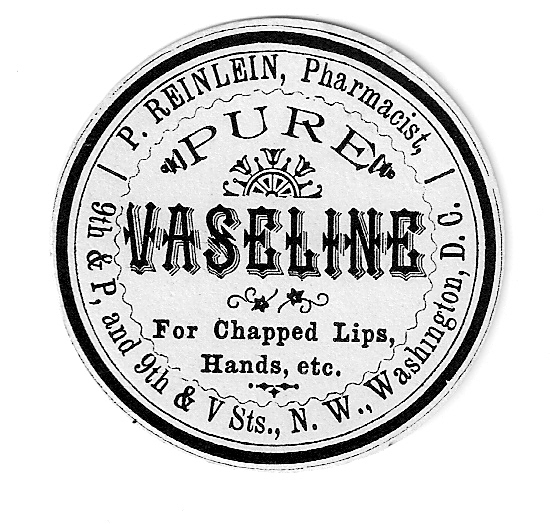 What many don’t realize, however, that the debate over labeling and tamper-proofing medicine bottles began well over 100 years ago, a call for change highlighted by the mistaken and gruesome death of Washington, DC druggist Paul Reinlein in 1887. I purchased several of his gummed labels from eBay about 10 years ago, and discovered his spectacular death once I began to research the man. 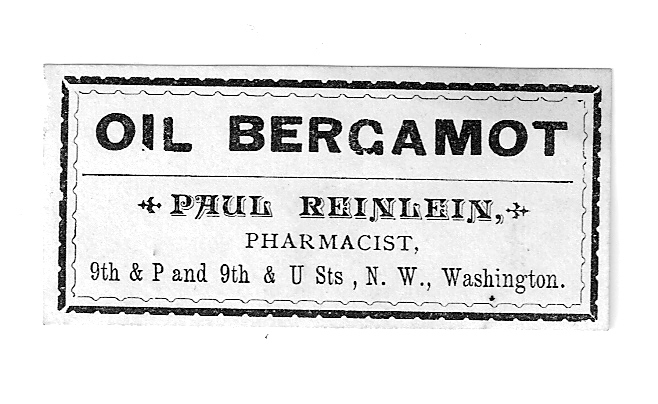 Reinlein then resided at 1424 9th Street, NW, near the intersection of P Street, where he owned a pharmacy close by, across the intersection at 1501 9th Street (now a vacant lot). His young business was successful, and he had recently opened a branch at 9th and Florida Avenue just a few blocks north. 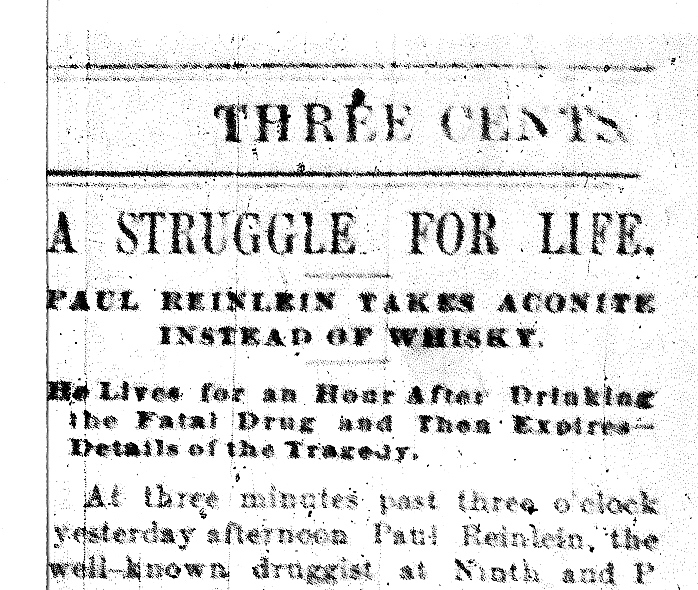 In the early afternoon of March 11, 1887, Reinlein would accidently drink a lethal shot of cincture of aconite, believing it to be a shot of whiskey. His dying moments would be reported in grisly detail the following day in the Washington Post. 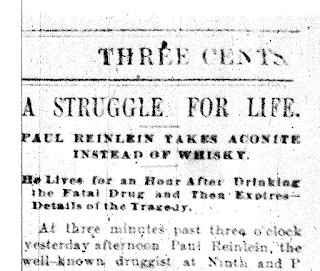 Oddly, nobody seemed to question why a druggist was drinking whiskey on the job in the first place. 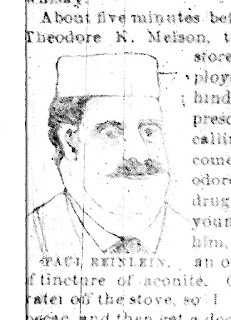 According to the federal census, Paul Reinlein was born Paulus Reinlein about 1830 in Germany, the son of Anton and Runigunda Reinlein. He arrived in the United States along with his parents on July 20, 1837 aboard the Constitution, which had sailed from Bremen, Germany about a week prior. They first located in Cincinnati, Ohio. Paul and his wife Anna relocated to Washington, DC in 1875. They first resided at 1428 6th Street, NW, today the site of the Kennedy Playground, where they were enumerated in the 1880 census. This was the second marriage for Anna, and the couple lived there with two children from her previous marriage; daughter Emma Fishback and son C.B. Fishback, who indicated that he worked as a newspaper correspondent. Anna Reinlein died in 1885. 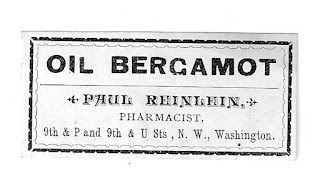 At 1:55 pm on March 12, 1887, Reinlein called out for his store clerk, Theodore Melson, and exclaimed “I have taken an ounce and a half of tincture of aconite. Get me the hot water off the stove, so I can take some ipecac, and then get a doctor quickly, for God’s sake.” Aconite is an herbal or homeopathic medicine that is still used for nerve pain, headache, rheumatism, and to treat cold and flu symptoms, as well as fever, severe anxiety, and even nervous excitement. It is derived from the aconite plant, and just 100 drops is enough for a lethal dose. 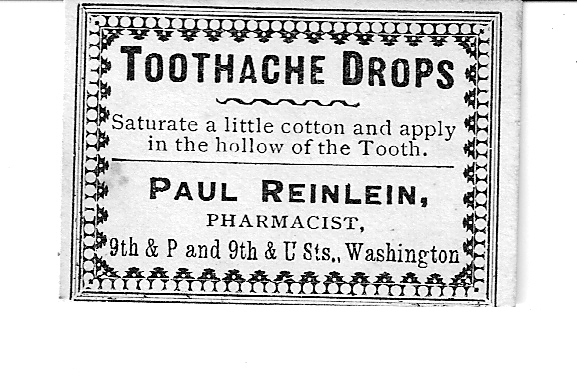 Reinlein’s clerk ran south down 9th Street and brought back Dr. S.S. Stearns, a good friend of the druggist. In the meantime, a neighbor ventured into the store, and asked Reinlein how he felt. He replied “Shut up – I’m going to tell the doctor all about it.” Reinlein kept his whiskey in the same sort of bottle that the aconite was kept in, with a different label. He had poured a shot of what he thought was whiskey about 1:50 that afternoon, and replaced the bottle. Dr. Stearns described to a Post reporter the rather shocking and gruesome details that followed. “I never saw a man appear as cool on the very threshold of death. As soon as he saw me, he held out his hand and said just as calmly as I am talking to you now, “Doctor, I have taken an ounce and a half of aconite and I can’t throw it up. 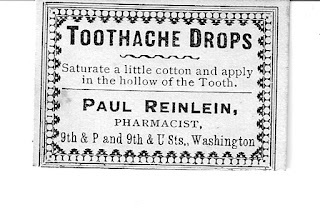 Five minutes ago I took enough powered ipecac to make twenty men vomit, and I have drank a quart of hot water with no better effect.” Stearns gave him “as big a dose of sulfate of zinc as he could swallow, and also a large cup of hot water” and sent the clerk to retrieve a stomach pump. Stearns conveyed that he “made every effort to make him vomit, for I knew, and he knew as well, that was his only chance for life…the poor fellow thoroughly realized his perilous condition and made a gallant fight for life…not one man in one hundred could have battled with death ten minutes after taking such a large quantity of aconite.” Reinlein then directed Stearns to give him mustard in hot water, which also had no effect. Stearns then stated that “he grabbed my arm convulsively, and bending his face close to mine, with a look that I will remember as long as I live, said “For God’s sake, Doctor, give me something that will make me throw up – don’t you know that I am dying before your eyes?” Stearns then had Reinlein ingest a tablespoon of pulverized alum in hot water, and he cried out “Thank God! Thank God, Doctor!” and vomited, but only a little bit, and both men lost all hope. It was 2:40 pm. An editorial in the Washington Post two days later, on March 13, 1887, called for new laws that would create several safeguards against such accidental deaths. They included proper labeling, pointing out that all medicines then had similar labels all in Latin which made it easy to confuse arsenic for alcohol, for example, and a stopper in bottles of poison that would stall their opening enough for a good look at the label.